ByAuthor melissa Postedon May 2, 2011 2 Comments on Sushi and bowling, what could be more natural? ‘m so glad that April is over. It was a really crappy month for the Johnson/Conger families, and we ended the month with Jonah missing Easter because he brought home some strep throat (the gift that keeps on giving), and Chris and Zachary went down hard. Fortunately for Zachary, he was feeling almost 100% by the end of the week, and played a great baseball game Saturday. Unfortunately for Chris, the strep bug gripped him tighter than an upside-down pole dancer grips her pole, and he was a miserable mess for almost 3 days. Which brings us to sushi and bowling. Chris wanted all of us out of the house so he could get some rest, and seriously, who can blame him? So he requested that I go and “do something fun” with the boys–I decided on bowling. Zachary hasn’t used his bowling ball since he received it for his 7th birthday (and he’s almost 8), and who doesn’t love a good bowling alley on a Saturday night? First, however, we had to stop at Marshalls for some new pillows, and it turns out there is a cute little sushi place in the same strip mall. I made the decision that we were going to eat there; it was, after all, right across the street from the bowling alley. Turns out it was a pretty good decision. The sushi was really good, and I actually got Zachary to try some, which he enjoyed except for my wasabi-laden soy sauce. The dinner entrees were yummy, the ambiance was great, and the boys and I had a really enjoyable dinner. Next stop, bowling! 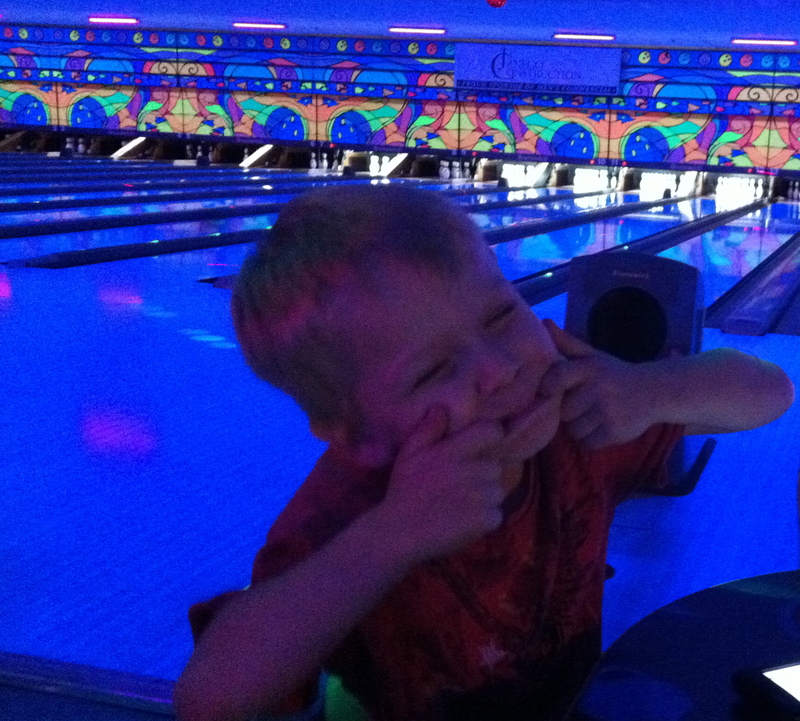 Bowling with an almost-8-year old, and a 4-year old can go one of two ways: great or awful. This time was great. We got there about an hour before cosmic bowling, and we bowled a few games. 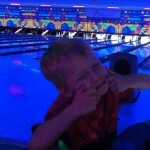 Then cosmic bowling started and instead of leaving, Zachary asked if we could bowl one more. Of course, I think he wanted to show off his awesome robot dance moves more than he wanted to bowl–we don’t have cool strobes and black lights at our house. So we stayed for one more. It was a really fun night, and very memorable. The boys were nice to each other (which wore off the next day, I knew it was too good to last too long), and we all had a lot of fun. There were also a few laughs–Jonah never disappoints. Check out the video of poor Jonah, learning the hard way, not to follow the ball down the lane, hee hee. If you’d like another little chuckle, check out Zachary’s smooth dance moves. The moment I initially left a comment I clicked a link that says-Notify me when new comments are added- Check box now every single moment a comment is added I end up with 4 email messages that has typically the the exact same comment. There has to be any way you can get rid of me out of that service? Thanks!